Montanya takes NYC by STORM! Barton Forum at the NY Public Library - MCC Gala 2012 Montanya headed to New York for the Manhattan Cocktail Classic, a week long cocktail and spirit celebration that kicked off with a phenomenal gala at the New York Public Library. 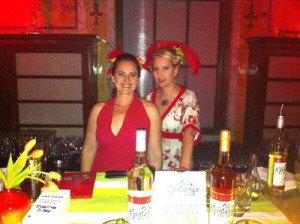 Montanya's team of Karen Hoskin and Michelle Baldwin bartended for three events and attended many more on behalf of the brand. At the Gala, Michelle and Karen served about 750 cocktails in less than 3 hours, and got tons of great feedback about how much folks loved the cocktails and the rum. We also attended the New York Indie Spirits Expo and the Industry Invitational at the Andaz Hotel. We will be back next year, so if you missed it this year, mark your calendars for 2013! To see more photos of the Manhattan Cocktail Classic, check out the MCC Gala Photostream at Flickr.